This is going to be short and sweet because frankly, I feel like crap. But I just couldn't let this experience fall into the crevices of my bad memory. I must warn you before you fall victim to the temptation of exotic soup. I think I'll rename it Thai Kitchen Coconut Ginger EWW. Yes, eww. It's gross. As you open the can you are welcomed by a dull sweet smell and a thick layer of coconut milk/grease that sticks to your fingers (I discarded that part). Once you've heated it the house is permiated with a spicy sweet and milky musty aroma (if you'd like to call it that). One taste and it was down the drain. It was so over the top gingery that it burned my mouth and throat. Even after I poured it down the garbage disposal you could still smell it for about 10 minutes. From start to finish this soup is pure torture. Heed my advice and save yourself the agony of this odd combo of cream and ginger. Oh, and one parting note: It has leaves in it. Just eww. Do you like other ginger and coconut flavored things? That coconut oil at the top of the can is probably an important part of the flavor - the fattiness of the coconut milk probably balances out the ginger. I've never tried this product so I won't argue with you, but I've had other products from them that are quite nicely flavored. 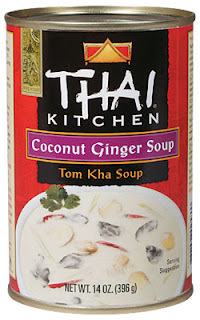 But then again, I eat coconut milk by the spoonful, and love ginger and other thai flavors. Bummer to hear you didn't like this one.